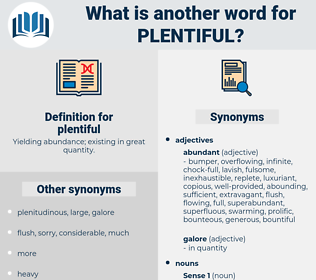 What is another word for plentiful? Yielding abundance; existing in great quantity. bountiful, sufficient, adequate, prevalent, multiple, affluent, voluminous, prolific, considerable, enough, many. ample, abundance, copious, rich, plenty, extensive, generous, numerous, substantial, vast, large. insufficient, scarce, lacking, impotent, meager, unproductive, fruitless, unfruitful, wanting, barren. miserly, mean, minimal, infertile, scanty, impoverished, niggardly, straitened, drained, bare, short, least, poor, minimum, narrow, sterile, exhausted. When I was a boy fresh water fish were almost as plentiful as salt water fish. Cusk are plentiful here in the spring, with a few in the fall.